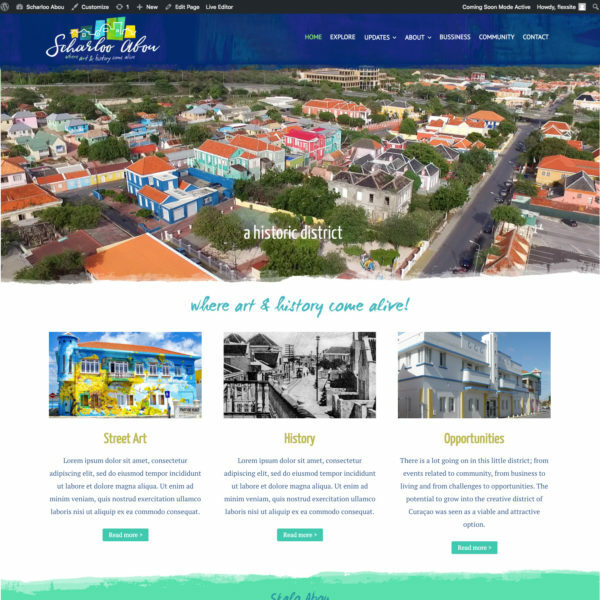 On 10 October 2018, during the Hello Skalo Foodies Fest, the ScharlooAbou.com website was officially launched. It is a digital platform highlighting all facets of this wonderful neighborhood. For the past months a small team of two worked on giving form to this idea. Being active and involved in the district in different ways they noticed a missing link; a platform where everything comes together! In a district where creativity and innovation is favored, going digital was a logical step. Scharloo Abou is a multi-functional area and there are many different initiatives undertaken by numerous organizations or individuals. These online mediums aim to facilitate the further growth of the district and community. This initiative was made possible with the support of Stadsherstel, Monumentenzorg and Curaçao Ports Authority. With this a firm setup and foundation was laid out and has now gone live. With future commitment and contribution from the organizations in the community this digital platform can continue to grow and further its reach. We choose to coincide our launch with the Hello Skalo Foodies Fest for a reason. Their mission is also to bring the community of Curaçao together in Scharloo Abou, though theirs is physical and offline. We took on the online challenge and hopes it helps more and more people to find their way to Scharloo Abou. This event seemed like the ideal opportunity to inform people about the new online platform while they are enjoying themselves in the district itself. Pictures of the launch will follow soon!